Experiences add invaluable value to our lives. After all, isn't it what we ultimately live for on a day-to-day basis? We want to experience the joy of eating a mouthwatering delicious meal, experience the sense of pride in getting promoted at work, experience the queasy butterflies in your stomach feeling when falling in love. There are so many intangible factors that add to the value of a wonderful experience, factors that are hard to predict but become so perfectly aligned when they do come together. The stars definitely aligned in my favor last week as I had the most amazing cut and color experience at the Rossano Ferretti Hair Spa in Beverly Hills. The pioneer of the patented Metedo Rossano Ferretti, master cutter and master mogul Rossano Ferretti developed a system that focuses on the natural movement of a person’s hair and teaches stylists to move their own body along with the client’s hair, constantly observing and interpreting each section. With over twenty salons in the most exclusive zip codes in the world, Rossano commands $1,000 per haircut, a price that bequeathes upon him the title of "The Most Expensive Hairstylist In The World." 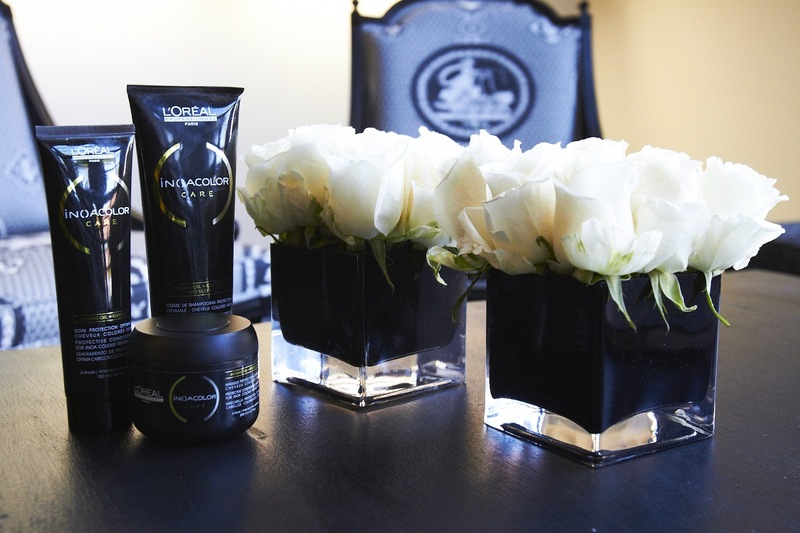 I met Rossano at an event in his salon where color guru Nancy Braun spoke about the new L’Oréal Professionnel INOA ODS2, an ammonia free permanent professionnel haircolor that provides uncompromised comfort, supreme respect for the hair and infinite color power. With the product, hair is left with 6 weeks of intense hydration and nutrition and 50% more shine. At the event, Rossano had just returned from a trip to Shanghai, where he was scouting potential locations for his next salon. We bonded over my undying and his new-found love for my birth city. He invited me to come back for a color and a $1,000 cut experience. I accepted in a heartbeat. Rossano and I chatting about Shanghai! I call it Paris of the East while he compares SH to New York. The next day, I was back at the Beverly Hills atelier. Rossano, dressed in a custom suit accessorized with his signature silk scarf (he wears a different one everyday), greeted me in the lobby with Italian charm and panache and introduced me to my colorist. She and I decided to bury my ombre with jet black color. The INOA color didn't smell like harsh chemicals and did not cause any irritation or burning on my sensitive scalp. I'm in my third week and have not noticed any color fading or dullness. In fact, I'm one happy dark haired goth girl! After the color came the cut. I was led upstairs to the private VIP room where a single chair and mirror stood mounted to the floor, singularly illuminated by the overhead spotlight. Once I sat down, I heard the velvet curtain close behind me. Five minutes went by. Silence. Then, in a single dramatic moment, Rossano emerged. He walked over and took a few seconds to analyze my tresses before lifting the scissor from the palms of his assistant. He then went to work, as the scissor instantaneously became an extension of his hand, wrist and arm. The entire cut took no longer than ten minutes and yet in those minutes a total hair transformation took place. He balanced out my crooked layers and infused movement, volume and lightness to my long hair. Who knew waist length hair can bounce? It was the cut of a lifetime and an experience to be remembered.